Enable Discord Streamer Mode: Did you ever dream of becoming popular on Twitch? Now, there is a possibility to become popular with Discord. It is one of the fastest growing VoIP platforms for the gamers across the world. There are a number of video game communities of which you can be the part of. 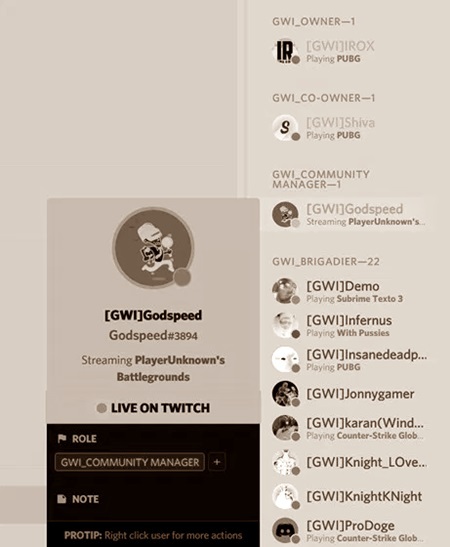 If you are popular in many communities that you have joined, the Discord streamer mode will help you to take its advantage. You can actively showcase to the community members that you are streaming something. Why Enable Discord Streamer Mode? 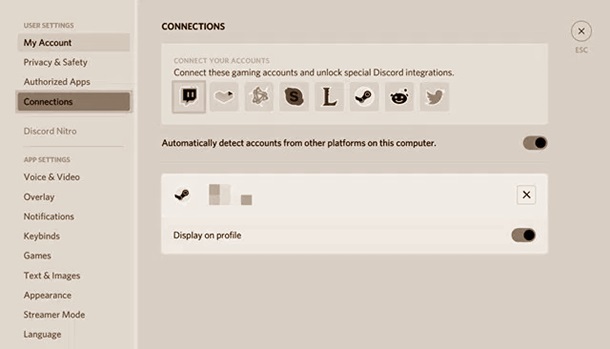 In addition to this, the streamer mode will help you hide the personal information of the account and will safeguard your privacy so that the random people who are your audience on Twitch stream will not be able to access the information of your Discord account. So, if you wish to show off your Twitch channel and improve the count of your viewers then enable Streamer Mode on Discord before starting the stream. But if you are new to the Discord app and don’t have the right clue to do so then follow our tutorial on how to enable streamer mode on Discord. You should note that the streamer mode on Discord can only be enabled if you are using the desktop application or the browser client. This option is not available in the mobile application. The foremost thing you need to ensure that the Twitch account must have been linked to your Discord account so that you can take the complete advantage of Streamer Mode in Discord app. Below, we have mentioned the easiest steps for linking your account and enabling the streamer mode without any troubles. After opening Discord, go to the ‘Settings’ options and then click on the gear icon. Move to the ‘Connections’ section and then click on the ‘Twitch Logo’. Now, log in with the Twitch credentials and then the things will work smoothly. In the ‘Settings’ menu, itself head towards the ‘Streamer Mode’ option and then enable it with the help of the toggle there. 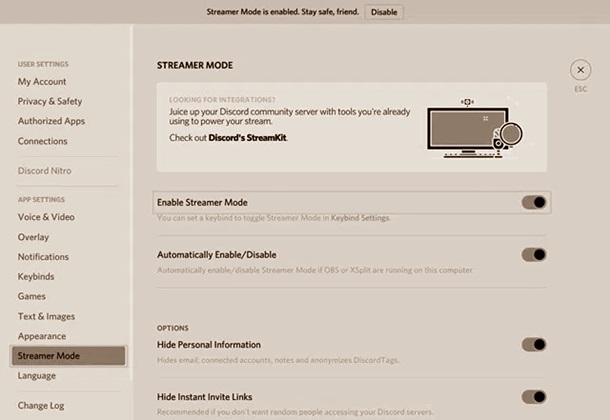 If you are using the third party software like XSplit or OBS on your computer, the streamer mode will be automatically enabled/disabled. You will be able to adjust the privacy control in the same section even if Streamer Mode is enabled. 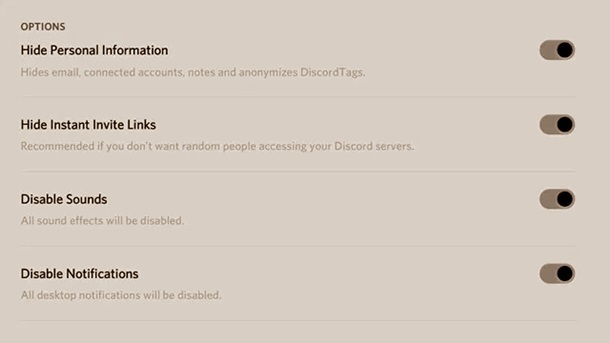 You can choose to hide the personal information like connected accounts, emails, notes, and the Discord tags as well. It is necessary so that the random users are unable to access them. Moreover, the instant invite links to different servers can be hidden. You can also disable all notifications and sounds while the streamer mode is enabled. Now, once you start streaming on twitch, your online status indicator for Discord will be changed to the purple color which will indicate everyone that you are streaming. The people who are connected to you on this platform will be able to watch your stream by clicking on ‘Live on Twitch’ option. How is Streamer Mode on Discord Beneficial for the Community in which you are added? If you are well reputed in the communities you have joined on Discord or rank higher in the community, then you can make use of the platform for getting a good audience to your stream and this will help you in increasing your popularity. Once the people start seeing the purple icon, a number of them will be interested in checking what exactly you are streaming and at last, they might follow you up. So, basically, the Discord Streamer mode lets everyone know that you are streaming live on Twitch. You can follow the above-mentioned guide carefully and leave your comments if any problem persists. We will try to solve your troubles as soon as possible.